The rise of the zebra mussel is no laughing matter: while Thames Water is currently investing millions of pounds upgrading London’s sewer systems, the water company spends approximately £1million each year tackling the problem of pesky, immigrant zebra mussels. Zebra mussels, whose name derives from the pattern often found on their shell, are small freshwater mussels found in the Black and Caspian seas. Considered as an ‘invasive species’, they are often accidentally carried into UK waters via the ballast water of ships coming from Eastern Europe. Zebra mussels live free from predators in the UK and they also breed at alarming rates, with females producing approximately 30,000 eggs in a single season. The mussels attach themselves to surfaces, and can live there for as long as five years. For UK water companies, this is a recipe for disaster. What problems do zebra mussels create for water companies? 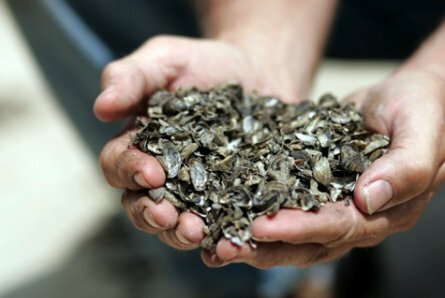 Zebra mussels have posed a serious problem to the power and water industries in the USA for over twenty years, costing them on average $500 million per year. The problem? Zebra mussels find their way into water systems, clogging up raw water and water treatment pipes. In the UK, water companies spend millions of pounds each year in an effort to tackle Zebra mussels using chlorine, and carrying out regular maintenance and cleaning. Elsham water treatment works in Lincolnshire even shell out £1.4million per year on mussel traps! Thames Water recently removed nearly 800 tonnes of zebra mussels from the main raw water tunnel into Walthamstow water works in northeast London at a cost of £250,000. A further 635 tonnes were removed from the Ashford Common water works in southwest London. The most recent solution on trial involves the use of fat-coated BioBullets pellets, manufactured by BioBullets Ltd. Both Thames Water and Anglian Water are running a six-month, government-backed trial of this new initiative. The 50 micrometres diameter BioBullet has a fatty outer coating (which attracts the zebra mussels), which covers an inner centre that kills the mussels but is harmless to humans and other aquatic creatures. The chemical has also been fully approved for use in drinking water treatment. The savings made in energy costs alone are very impressive. Such is the expected success of BioBullets, a BioBullets manufacturing site is being constructed in the UK, after an award of £500k was given by the Technology Strategy Board (TSB), which is being match-funded by Anglian, Thames Water and Tastetech. *For those imagining a tastier solution: zebra mussels are entirely inedible – sorry! This entry was posted on August 10, 2011 at 5:47 pm and is filed under Water & wastewater. You can follow any responses to this entry through the RSS 2.0 feed. You can leave a response, or trackback from your own site.